Yoga Mala is a whole-body prayer through a repeated cycle in divisors of 108. It is a devoted offering that can come from mantra Japa (repetitive uttering of a mantra) or yoga asana. When we conduct our practice, we tend to follow a flow of poses from one into another; but often, we intend to increase our difficulty within the poses; to improve our strength, balance, and flexibility. 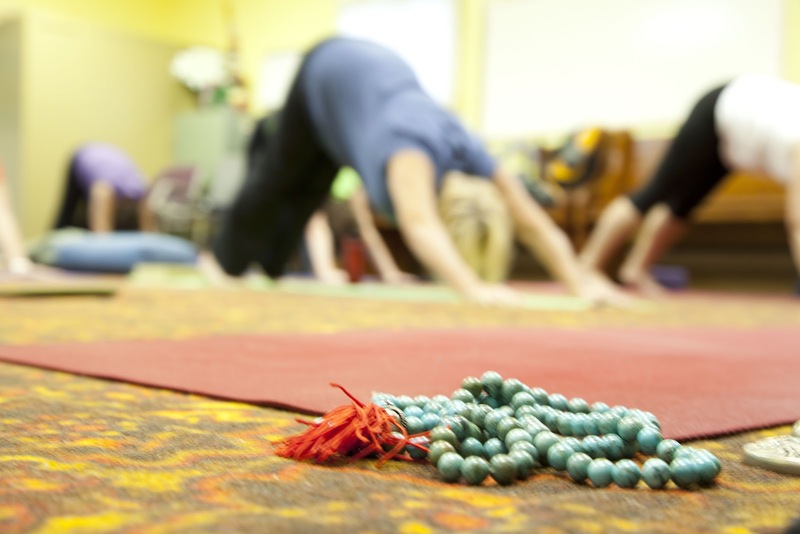 Yoga Mala is less about the poses and more about spiritual practice. As mala beads, meaning “garland” in Sanskrit, are connected to create a circular and continuous form. When we use the term yoga mala, we are referring to a circular and repeated cycle within our practice. Within the yoga mala, the types of offerings are mantra Japa, pranam and yoga. This specific mantra involves chanting that can be done internally or aloud; as Japa means that it is offered continuously. When you choose to practice this type of offering, you may select an English mantra or a Sanskrit mantra. While either is perfectly acceptable, the Sanskrit mantras are meant to awaken your whole being with vibration, and not just within the mind. The mantra is intended to be short and powerful and can be easily learned through repetition. The belief is that mantras are the sounds that should complement our yoga asanas; and in order to fully understand yoga, you must have knowledge of mantras. This mantra offering is a gentle yet transformative practice. You may choose to either offer traditional Namaskaras (salutations) or Pranams (prostrations). Prostration is the practice of kneeling and involves the physical gesture of bowing to convey respect, honor, and reverence. The pranam is where the whole body surrenders itself to the earth in a flat position. To complete the pranam, the practitioner will begin standing and then lowering the hands to the ground, walking them away from the feet to bring the entire body face-down on the earth. You may place the forehead on the hands like a pillow and will want to remain in the position for at least one cycle of breath. Once you have completed your cycle of breath, you may return to your standing pose. You may also choose to complete your cycles with your eyes closed. Lastly, we come to the yoga mala which is where you use a combination of poses to equal a total of 108, just like the number of mala beads. You may also do a shortened practice, such as 27 or 54 cycles. One example of this would be, but not restricted to, 12 cycles of 9 sun salutations; but keep in mind that this would be quite a challenge for even the most experienced Yogi. As a result, you may want to introduce some modifications within this offering; such as alternating between a full pose and a modified pose. Despite this being an offering, you do not want to deplete all of your energy. This number has great significance across many different cultures. One particular example is the 108 chapters of the Rig Veda, which are written in Sanskrit, a language that has 54 letters. Each of the letters has a masculine (Shiva) and feminine (Shakti) form; we can, therefore, take 54 and multiply it by 2, to equal 108. The relationship to this sacred number is seen in other examples, such as within the field of Ayurveda where there are 108 sacred places. We also already mentioned the 108 mala beads used for prayer. Because the beads specifically have 108 within their cycle, these are great to use within your Yoga Mala practice. When To Practice Yoga Mala? As this practice is meant to cleanse and invigorate the individual, you may choose to practice it during the beginning or end of a change in season or shift in the time of year, such as a holiday time (like the New Year) or even during a personal change. A Yoga Mala requires dedication but can be a great way to clear a path for new changes in your life. It can dissolve the past, aid us where we may feel stuck in life, and stimulate our intentions for the future.